I’m a huge fan of the Canon Digital Elph series. 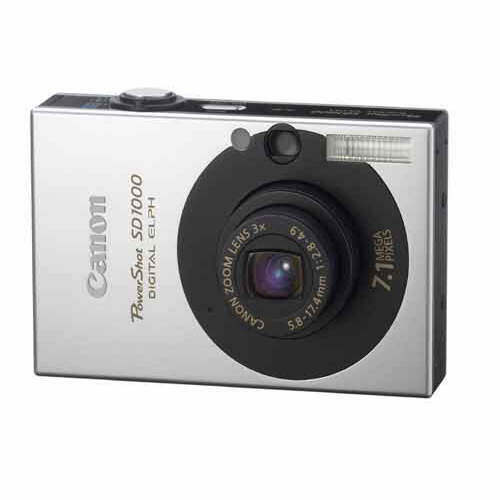 I bought a Canon S100 in 2000, a SD110 in 2004, and an SD1000 in 2007. Each camera has been a huge improvement over the previous camera, is small enough to carry everywhere, and has taken some great shots. The SD1000 has one neat touch; it resembles the wildly popular APS film Digital Elph, Canon’s first camera of it’s kind. File Size 373KB/sec. 703KB/sec. 1,963KB/sec. 1,363KB/sec. 131KB/sec. 64KB/sec. 32MB 1 min. 7 sec. 38 sec. 14 sec. 20 sec. 3 min. 9 sec. 7 min. 30 sec. SDC-128M 4 min. 39 sec. 2 min. 42 sec. 1 min. 1 sec. 1 min. 27 sec. 13 min. 2 sec. 31 min. 45 sec. SDC-512MSH 17 min. 58 sec. 10 min. 29 sec. 3 min. 57 sec. 5 min. 39 sec. 50 min. 21 sec. 123 min. 30 sec. Storage Capacity varies depending on camera settings. This data is estimated from Canon’s standard shooting conditions. Figures for Movie Mode represent total capacity of the particular media. Playback Time Approx. 240 min. (NB-4L)* The above figures comply with CIPA testing standards and apply when a fully-charged battery is used. Note: Note: 25 display languages provided (English, German, French, Dutch, Danish, Finnish, Italian, Norwegian, Swedish, Spanish, Simplified/Traditional Chinese, Japanese, Russian, Portuguese, Korean, Greek, Polish, Czech, Hungarian, Turkish, Thai, Arabic, Romanian, Ukrainian)All data are based on Canon’s Standard Test Method. Subject to change without notice.